A Competition of the best production of an exhibition space for schools. Gef has reserved some exhibition areas for schools, (aprox.4 smq.). The schools, selected among all applicants, will be able to exhibit one or more projects. The participating schools may add their own props (easels, posters, whiteboards, etc. excluding music) to the exhibition, as long as no direct or indirect publicity is included. Interactive projects (involving visitors) will be appreciated. The number of spaces are limited. Applications will be accepted only while spaces are available. Schools’ representatives must stay in their exhibition areas during opening hours. 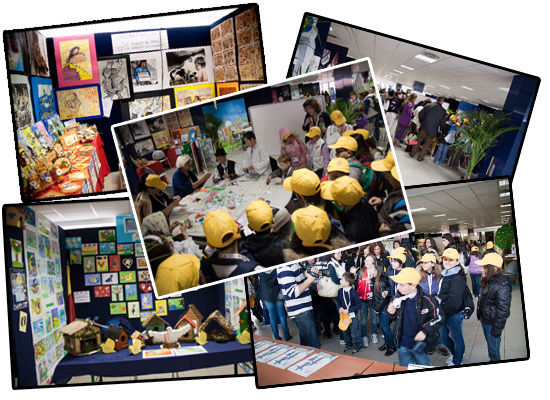 A judging panel composed by experts from the school world will select the best of the school’s exhibition stands. The prize-giving will take place during one of Gef’s finals. The exhibition area is free of charge for the schools visiting the area. If a school reserve an area but during GEF they are not using it, there will be a penalization on their results in other competitions in GEF. The decisions by GEF’s committee are final. Download Complete Entry Form Here!